After restoring credibility in the 2005 hit Batman Begins, British director Christopher Nolan returns to Gotham City with this highly anticipated sequel. In The Dark Knight, Batman (Christian Bale) squares off against a new foe: the Joker (the late Heath Ledger). Nolan’s second Batman film is a more gritty, darker and brooding story. Certain scenes will leave a lasting impression that you never imagined and the sense of drama will continue to sustain disbelieve in how fantastic this film is. The Dark Knight is certainly the most violent, gripping and thrilling in the superhero series. Christian Bale once again plays the Caped Crusader, sworn to fight the evil and injustice, though his perception of justice is causing an emotional and personal shift. It’s fascinating to see the talented actor playing on these themes that you emphasise with Bale’s flawed hero more than Michael Keaton, Val Kilmer and George Clooney. Bale is probably the best actor to play the Bruce Wayne/Batman character and his performance in The Dark Knight is first-class. But it is Bale’s late co-star that steals the film. Heath Ledger is simply outstanding in the role of The Joker. He makes Jack Nicholson look like a cartoon figure! Yes, Nicholson was great in Tim Burton’s 1989 Batman but he takes it to a whole new level. Ledger’s character reveals a more sinister, twisted and psychotic side that it becomes deeply disturbing. 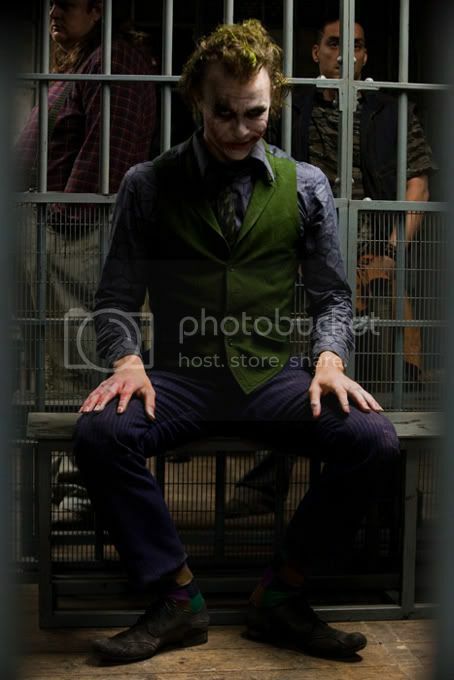 With a cynical smile, he proclaims in a scene where Batman is a freak to the public, like the Joker himself. This also explains the balance of righteousness that Bruce Wayne is going through. The Joker is downright evil, and Ledger makes this performance legendary. As for the rest of the cast, Aaron Eckhart performs superbly in the role of district attorney Harvey Dent. The transformation into Two-Face is truly fascinating and shocking. Maggie Gyllenhaal is a great replacement for Katie Holmes as Wayne’s love interest Rachel Dawes. She shows a more sensitive and caring side towards Bruce, other than Holmes’ nearly flat performance in Batman Begins. Sir Michael Caine and Morgan Freeman are perfect as Wayne’s ancillary staff playing the loyal butler and CEO of Wayne Enterprises respectively. And special mention goes to Gary Oldman, who does a marvellous job of portraying Lieutenant James Gordon. Moving on to the set pieces in The Dark Knight, the action sequences are nothing short of remarkable. It is really exhilarating in particular the opening scene with a high-tension, high-anxiety bank raid. Another outstanding moment was the duel between Batman’s bat bike and The Joker’s 18-wheelier. Fantastic! The cinematography is also breathtaking. At one point, Batman travels to the Far East to track down a lead and to see Hong Kong in all its glory is stunning. Alongside the new Gotham City, the atmosphere and mood in The Dark Knight is a work of art. I must applaud Christopher Nolan for his hard work in this film. Not only for writing a great story about corruption and chaos but also in casting great actors. Yes, The Dark Knight is Heath Ledger’s final performance but he is the main reason that makes this film so entertaining and thrilling. This is by far the best Batman film. It certainly lives up to the hype. See it for Bale, for Ledger, for the music, the action and for Nolan’s flawless direction. Lewis Hamilton scored his fourth Grand Prix victory of the season with a sensational drive at Hockenheim. 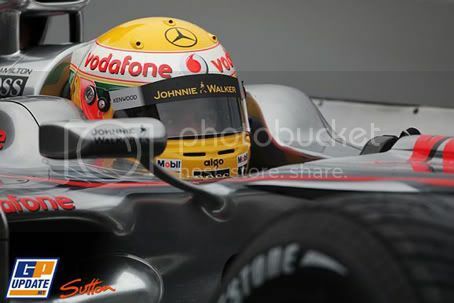 The McLaren driver was clearly the fastest around the German circuit after setting the pace all weekend. Even though he missed the opportunity to pit during the safety car period – as a result of Timo Glock’s crash on the main straight – Lewis was able to showcase his supreme race craft by overtaking his fellow championship rival Felipe Massa and surprising race leader Nelson Piquet, in the final stages to take the chequered flag in style. It was a great drive by Lewis, as he had to fight hard for the win. In the first half of the race, it was so easy for the McLaren star. He made a clean getaway off the grid and was steadily pulling away from second-place man Felipe Massa at a rate of a second a lap. But then the race took a dramatic turn on lap 35. Exiting the final corner, Timo Glock suffered a right-rear suspension failure on his Toyota and he slammed hard into the pit wall backwards. The German escaped unharmed but the safety car was summoned while the debris was cleared up. While the field was running under the full course yellow, the pit lane was opened and practically everyone came into the pits for a change of Bridgestones and fuel. Well, apart from Lewis, BMW Sauber’s Nick Heidfeld and Renault’s Nelson Piquet. Suddenly the easy Sunday drive for Lewis became a tense affair as McLaren decided not to pit the race leader during the caution period. McLaren team principal Ron Dennis admitted later they underestimated how long the safety car would stay out for. It was a big mistake by the team but Lewis had the speed and confidence to regain lost ground. By the time Hamilton pitted for his final stint, he lost track position to Heidfeld, Piquet, Massa and team-mate Heikki Kovalainen. If he wanted to win the race, Lewis would have to drive hard to reclaim it from his fellow rivals. This he did with fine style. 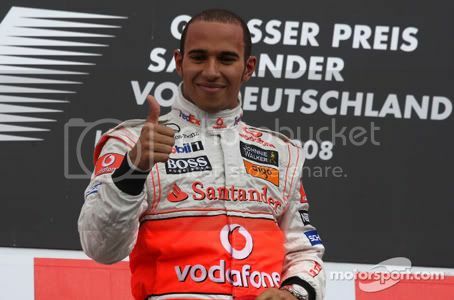 First Lewis was let through by his McLaren team-mate Kovalainen. He was up to fourth. This became third when Nick Heidfeld made his pit stop on lap 53. Only Massa and Piquet stand in his way of claiming this German Grand Prix victory. Lewis was catching the Ferrari at an alarming rate, over a second per lap and on the 57th tour; the McLaren was in the slipstream of the red car. Lewis dived down the inside of the Brazilian into the hairpin and second place was his! Next up was race leader Piquet in the Renault. Nelson Piquet was driving a beautiful race in the R28. Even though he started from a lowly seventeenth on the grid, the Brazilian benefited significantly during the safety car period. He made his only pit stop at half distance and when Timo Glock slammed into the pit wall, Piquet gained track position from the others. Piquet did well to defend his race lead but against the mighty McLaren from his old GP adversary, the Brazilian didn’t stand a chance. Lewis was in a determined mood and made the decisive pass down the inside at the hairpin. Still, second position is quite an achievement for Nelson, especially after a difficult start to his Formula One career this season. Ferrari was outclassed by archrival McLaren on race day and Felipe Massa was the best finisher for the Scuderia. He had the opportunity to win during the safety car period but the F2008 wasn’t fast enough to challenge Lewis. Third was the best for Massa while team-mate Kimi Raikkonen had a dismal weekend. The world champion struggled with the car’s balance throughout the German Grand Prix and to finish sixth was another disappointing result. Nick Heidfeld finished fourth for BMW Sauber, edging out the Finns of Kovalainen and Raikkonen. Team-mate Robert Kubica was down in seventh. The final point went to Sebastian Vettel after a feisty run for Toro Rosso saw him see off the likes of Toyota’s Jarno Trulli and Renault’s Fernando Alonso, who were ninth and eleventh after the latter spun at the hairpin late in the race (it was a frustrating race for the double world champion). Nico Rosberg finished tenth for Williams. Toro Rosso’s Sebastien Bourdais took twelfth, with David Coulthard finishing thirteenth after a poor start and a later tangle with Rubens Barrichello that ended the Honda’s race. The only non-finisher was Mark Webber, whose Red Bull expired in a cloud of smoke while running behind the safety car. What had looked set to be a low-key race literally exploded into life due to Glock’s crash and McLaren’s gamble in keeping Hamilton out when everyone else pitted. Luckily for McLaren, Lewis had the ability to make sure the gamble paid off and he now leads the championship with 58 points. *Received a 25-second penalty for unlapping himself when he was not allowed to, demoting him from 14th to 17th. Lewis Hamilton continued his impressive form by outdueling championship rival Felipe Massa in a tense fight in Q3 at Hockenheim. The British Grand Prix winner set an impressive pace around the 2.841-mile race track with a time of one minute, 15.666 seconds. This was Hamilton’s ninth career pole position in Formula One. Hamilton’s McLaren team-mate Heikki Kovalainen will line up in third after a mistake on his first flying lap. The Finn went off on his approach to the stadium section during his timed run but he did well to recover, unlike fellow countryman Kimi Raikkonen in the Ferrari. The world champion seems to be having great difficulty in his F2008. From turn-in understeer to oversteer on the exit of corners, Kimi just lacked the confidence and speed compared to team-mate Massa. To qualify in only sixth place was a major disappointment for the ‘Iceman’ but the team remain optimistic that Kimi will be a big factor in the race despite a poor start to his German Grand Prix weekend. Toyota’s Jarno Trulli achieved another excellent qualifying run with fourth. The Italian hope his high grid position will result in a podium finish just like he did at Magny-Cours last month. This can be achievable providing Jarno doesn’t get left behind by the faster McLarens and Ferraris on race day. Double world champion Fernando Alonso will start in fifth for Renault. The Spaniard was quite surprised to be in the top six after admitting the team might struggle in making through to Q2. This was proven by team-mate Nelson Piquet, who will start in lowly seventeenth position. Even though Alonso is happy to be in the top half of the grid, I reckon he will have great difficulty in keeping up with the faster cars in the 67 laps race. Canadian Grand Prix winner and championship contender Robert Kubica could only manage to qualify his BMW Sauber in seventh. It wasn’t the best result for the Polish driver, who suffered a drive-shaft failure leading up to qualifying. 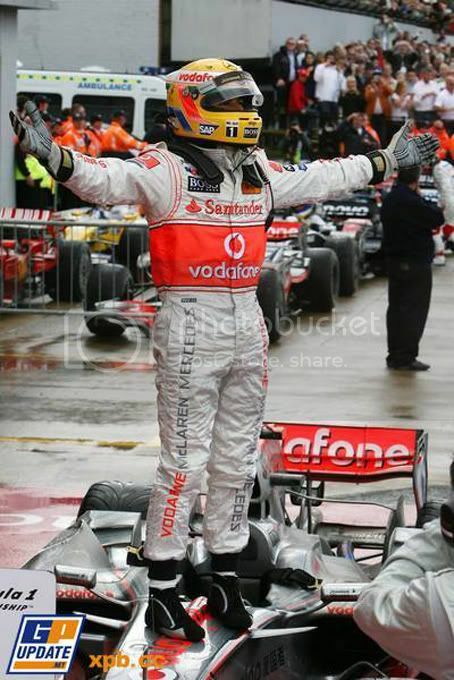 At least, he did a better job than team-mate Nick Heidfeld. The German made a costly error during his timed run in Q2 and will start his home race down in twelfth position. The present and future Red Bull trio of Mark Webber, Sebastian Vettel (Scuderia Toro Rosso) and David Coulthard completed the top ten. Rain is expected in Sunday’s German Grand Prix and we all know what kind of action and drama that will bring when the track is wet! Lewis Hamilton will have the clear advantage with his front row slot but can Felipe Massa challenge him for the race victory? Let’s find out on race day. Lewis Hamilton achieved his lifelong ambition by winning the British Grand Prix in style with a commanding drive in the tricky wet conditions. The McLaren driver was under heavy criticism over the last couple of weeks from the press following two disappointing races, so to win at Silverstone in front of the passionate home crowd was a perfect result for Lewis. Hamilton’s victory margin was simply stunning as he lapped nearly every car in a dramatic 60-lap race at the former RAF airfield. Only Nick Heidfeld and Rubens Barrichello (second and third respectively) finished on the lead lap as everyone else was struggling in the tricky conditions. It was Heidfeld’s third visit to the podium. The German even pulled off some beautiful overtaking moves all in the Luffield corner. First, he passed Timo Glock’s Toyota around the outside and then inside Fernando Alonso in one go. Several laps later, Heidfeld did it again when battling with Kimi Raikkonen and Heikki Kovalainen. Second place was a great achievement for the BMW Sauber driver. As for Rubens Barrichello, it was a super drive from the Brazilian. The team and driver made a good call by switching onto the Bridgestone extreme wets during the heavy rain shower. By running on this tyre, he was able to pass cars left, right and centre with ease. In fact Rubens was even quicker than race leader Lewis Hamilton at this point of the race! To finish third is fantastic result for the Honda driver, especially when you consider he started way down in P16. World champion Kimi Raikkonen could only manage fourth for Ferrari but it should have been a lot more. The team made a tactical error during its first pit-stop by not opting to change the immediates Bridgestone for Kimi. The heavy rain shower that followed meant the Finn lost so much speed and time over Lewis Hamilton. Pole-sitter Heikki Kovalainen must be feeling disappointed to finish the race down in fifth. The Finn actually made contact with his McLaren team-mate on the opening lap exiting Copse in a desperate bid to stay in front. He lost the lead soon after when Hamilton lunge down the inside into Stowe. Double world champion Fernando Alonso finished sixth for Renault and he too was a victim by staying out on worn Bridgestones during the heavy rain shower. Alonso struggled badly on pace and was passed by the recovering Kovalainen (who spun his McLaren during the wet stages of the race). The Spaniard managed to hold off Jarno Trulli’s Toyota and Kazuki Nakajima’s Williams in the closing laps of the Grand Prix though. Even though Nakajima made a few trips off the road, he drove another impressive race to score some valuable points for the Williams team. As for Trulli, the Italian at one point was up to third before making his final pit-stop; still it was a good result for team and driver. Not so in the sister Toyota of Timo Glock, who went around in circles(!) and finished down in twelve. Nico Rosberg did well in the difficult handling Williams to finish in ninth, though he had to make an unscheduled pit-stop after colliding into the back of Glock. Without that incident – the German was running on the same tyres as Barrichello (the extreme wets) – he would have finished higher. Poor old Mark Webber. The Australian made a bad start and was immediately overtaken by the fast starting Lewis Hamilton down the inside into Copse. To make matter worse, he spun exiting Becketts… The Red Bull Racing driver was able to recover but more spins followed and in the end, Webber finishing in a depressing tenth. At least he was ahead of Felipe Massa, who had a nightmare weekend at Silverstone. First off, he crashed his Ferrari after slipping up on Alonso’s oil in the opening practice session. Then he had that wheel-nut problem in qualifying, missing out on a run to do a fast lap. And in the race he spun no less than five times! He was the last remaining runner in the British Grand Prix, behind Toro Rosso’s Sebastien Bourdais and Timo Glock. As for the other title contender, Robert Kubica had the opportunity to move into the points lead but he lost control of his BMW Sauber under braking for the Abbey chicane. In terms of the list of retirements, Jenson Button was unable to stay on the road despite running the same tyre as team-mate Barrichello. Nelson Piquet was in a potential point scoring position but lost control of his Renault and headed into the Abbey gravel trap. Both Force Indias ended up in the gravel too with Adrian Sutil aquaplaning (almost hitting Bourdais along the way) and Giancarlo Fisichella spinning while being lapped by the fast Hamilton. As for David Coulthard, the Scot’s final race in front of home fans didn’t even lasted a single lap as he collided into Sebastian Vettel at Priory. But the day belonged to Lewis Hamilton. His victory at Silverstone was the perfect answer to his race critics. He didn’t put a foot wrong in the wet conditions and it will be fascinating if he can keep up this winning momentum in the second half of this exciting Formula One season. The result means he is now the joint leader in the standings with both Ferrari drivers on 48 points. Kubica is only two points behind! Heikki Kovalainen claimed his maiden pole position at the British Grand Prix, while his McLaren team-mate Lewis Hamilton was demoted down to fourth place after making a costly mistake on his first flying lap. It should have been Hamilton taking the top spot as he had the quickest car around the Silverstone circuit. But that oversteer moment into Priory cost him time. Despite this set back, Lewis still has the opportunity to do well in the race even though his team-mate is at the front of the grid. Heikki’s pole position time of one minute, 21.049 seconds was half a second quicker than the nearest rival, that of Red Bull Racing’s Mark Webber. To qualify ahead of the Ferraris is an impressive achievement for the team and the Australian. It will be fascinating if Webber has the pace or the right fuel strategy to match the top runners in the 60-lap race. World champion Kimi Raikkonen will start in third place with home crowd favourite Lewis Hamilton joining him on the second row. It wasn’t a great performance from the Scuderia, as both Raikkonen and Felipe Massa seemed to lack the outright speed that many were expected. It was quite a surprise to see the two red cars struggling in Q2. To line up third and ninth (Massa) was not the result the team were looking for. For the first time this season, Nick Heidfeld outqualified his BMW Sauber team-mate Robert Kubica with fifth position. The German was able to generate enough heat into his Bridgestone (his main problem this year) to edge ahead of Kubica. The Polish driver was unable to set a competitive lap time in Q3 due to puncture and will start in tenth place. Fernando Alonso and Nelson Piquet will line up in sixth and seventh respectively. The Brazilian is beginning to regain his confidence in the Renault R28 after a poor show earlier this year. Sebastian Vettel continued his promising performance with ninth for Toro Rosso, one place ahead of world championship leader Felipe Massa. The Brazilian was heavy comprised in Q3 by a wheel-nut problem in the pits, meaning he missed the chance to set a competitive lap time. To line up on row five is a major disappointment for Felipe. Two-time Silverstone winner David Coulthard will start the race in eleventh. It will be Scot’s final home race after announcing to the world’s press that he will retire at the end of this year’s championship. As for the other British driver, Jenson Button got caught out in the brief rain shower in Q1 and was unable to set a lap time in the Honda. He will start the British Grand Prix in P17, behind his team-mate Rubens Barrichello. Sunday’s race will be deeply fascinating as there is a slight possibility of rain. 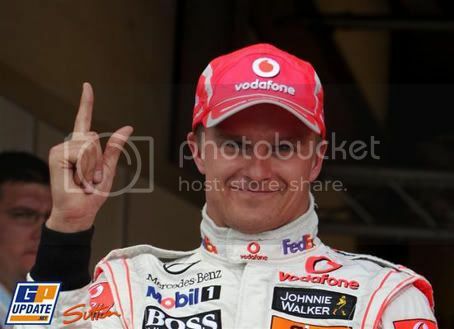 Can Heikki scored his dream result for McLaren by winning in front of the passionate British crowd? Does Webber have the genuine pace to match him? What about Raikkonen and Hamilton? Can we expect the ‘Iceman’ and the Brit to stage a comeback drive and win the race? Let’s find out tomorrow in the penultimate race at Silverstone.